In what has been quite the whirlwind season for Ilya Bryzgalov took another turn early Tuesday afternoon as the 34-year-old goalie was traded to the Minnesota Wild. Last time on the chronicles of the world’s most interesting goalie, we saw Ilya Bryzgalov head to Las Vegas for a tryout with the ECHL’s Wranglers. We speculated how the step back for the cup winning goal could still lead to inquiries from NHL and, lo and behold the Edmonton Oilers announced earlier this evening their acquisition of the 33-year-old netminder. For the first time since 2004, three Russians were selected in the first round of Friday’s NHL Draft in Pittsburgh. Much speculation was made beforehand as to whether the Edmonton Oilers would trade their first pick having picked first the past two years. 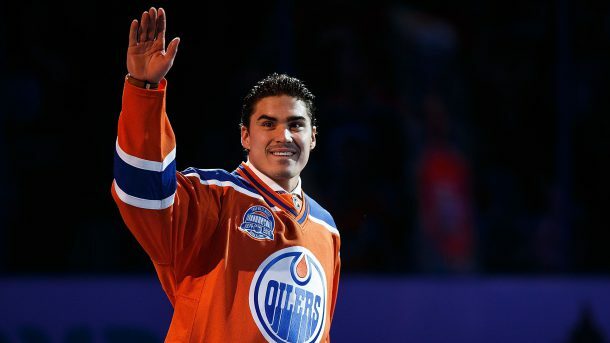 Any suspicion was quickly put to rest when GM Steve Tambellini announced 18-year-old Nail Yakupov’s name making him the third Russian to ever be picked first overall in draft history. With the struggling New Jersey Devils trailing the Oilers by 2 goals late in the first period, Alexander Vasyunov scored his first NHL goal. Vasyunov slipped in behind the defender to get open in front of the Devan Dubnyk and banged home a Travis Zajac pass. The goal helped the Devils rally to win their first home game of the year. Patrik Elias also assisted on the goal. Vasyunov, 22 years of age, is 8 games into his young NHL career and now has points 3 points (1 goal, 2 assists) and points in back to back games. He played 24 shifts on Friday night for a total of 18:16 of ice time, both career highs. On Wednesday night against the Buffalo Sabres he assisted on David Clarkson’s goal, also the first goal for the Devils that night. The 2009-10 season is one the Edmonton Oilers want to forget as soon as humanly possible. Nikolai Khabibulin is no different, thanks to injury problems and off-ice troubles. But, as always when a new season begins, teams are reborn with a clean slate. If first impressions tell anything, the Oilers and the Bulin Wall have a lot to look forward to in 2010. 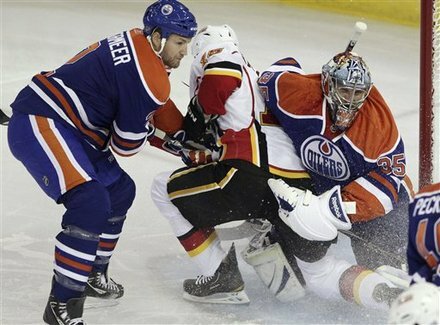 The 37-year-old nyet-minder from Yekaterinburg stopped all 37 shots he faced as he helped the Oilers shut out the rival Calgary Flames 4-0 on Opening Night. Playing in his first game since last November, Khabibulin looked to be in midseason form from the drop of the puck. While the off the ice stories have been piling up this summer with signings, rejected contracts, and KHL poaching’s it was revealed on Friday that Edmonton Oilers goalie Nikolai Khabibulin was found guilty on two of three DUI charges in Phoenix, Arizona. The 37-year-old Yekaterinburg native was pulled over back on February 8 where he was charged with speeding, driving while intoxicated, and impaired to a slight degree.